Never doubt her strength. She picks this big notebook and rips its screen of as it was nothing and in a amazing display of her incredible strength she broke its base in half just using her muscular arms. Shes ungodly strong we sae a lot of notebooks being destroyed but nothing like that. She broke ir piece by piece. It is soo fragile in her strong hands. Bombshell, she is strong and beautiful. She went to a scrapyard where she found an old market cart. Those carts are made of metal and sturdy to be able to carry alot of weight. But none that could stop Bombshell to destroy it. She bends and rips the cart apart using all her strength it is possible to see so much strength that she has to put on it. She is able to bend even that steel and metal. Lidia, she is not just beautiful and sensual, she is far stronger than an average girl. Far stronger under those beautiful smile are muscles capable of bend metal bars. In this video she bends reiforced bars from diferents sizes, from small to larger ones. Even bodybuilder may have difficult to bend those but she did it. She aways show those nice biceps and triceps for us, she flex that steel muscles even more after. Alessandra Alves uses her full strength against few apples, those did not have any chances against this lady strength. This is amazing seeing never like before she simply burst apples between her hands when she goes full strength. 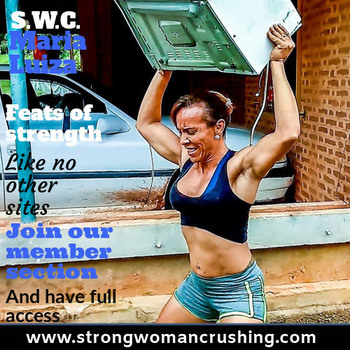 Some are crushed in her iron like biceps. Bombshell, she never does anything easy. She saw another girls destroying some toolboxes and she decided to try one. But when she wants to prove something she does not goes easly. She picks an construction heavy toolbox instead a normal one. Those are sturdie to withstand all those construction abuse. But that did not apply to bombshell. She throws it like a paper and using her body strength she is able to bend some parts and even rip the handle of. If she in the end that toolbox was destroyed beyond any construction accident could do. Alessandra Alves uses her big and heavy muscular legs to crush a watermelon. A very big and hard watermelon. This is a messy video, she also uses her muscular arms to crush the rest of that watermelon letting the juice flow over her muscular body… impressive such strength and beauty. Gil Cunha she has those big muscles and those are not for display only. She picks on of the biggest metal toolbox we have seen till now. It's new and shinning. Someone locked with some metal bar. That's is not enough she rips that bar of the metal box and starts to bend and trashing it. It's possible to see the metal trying to resist her incredible strength but she is far stronger than it. She totally destroys it. You can see her satisfaction I'm the end. Glauce she´s strong and beautiful now we could see her nice toned muscles flexing and posing at pool. Relax and enjoy this view she is simply amazing, she walks around posing and flexing in diferent angles and place, takes a shower and even swing in this video. This is a gift for our posing and flexing fans. Physique she proves us that she is fasr stronger than we ever imagined. She picks some sturdie metal tools and uses it to show her strength she bends end destroys every things. She even breaks some woods using her muscular arms and using her strong strong body. She slams those wood pieces and have them broke agains those hard muscle. Maria Luiza impress us again. Now she picks a big refrigerator for a test. It is impressive how she alone could lift it from the groud several times, actually throwing it like a toy using her strong muscles. She rips its doors like they where made of paper. nothing could stant against her full strength. Glauce she uses her strength to destroy a fair cart. That metal cart does not stand any chances against Glauce muscle strength. Her raw strength is impressive and adding some nice muscles and beatiful face this is one hell os strong girl. She starts posing and flexing for us, them she goes by applying some strength against the cart, that was enought to bend it and break some parts. In the end you cant even tall that was a metal cart. Her muscular biceps, abs and legs are amazing for. She bends and break everything. Muscle girl, muscular women, strong girl all those defines Glauce.